Dabur - Bhasma - Worldwide Shipping. Is a nervine tonic used widely in respiratory tract infections and anaemia. Dabur Abhrak Bhasma is recommended for breathlessness due to Chronic Bronchitis, Asthma, Chest Congestion, initial stage of TB. It is prepared by treating biotite (mica) with the juices of many reconstituent plants that makes it a powerful cellular regenerator. General Weakness, Respiratory Ailments, Restlessness, Anaemia. 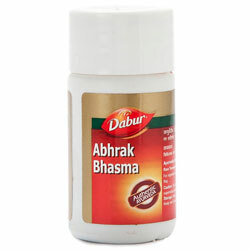 Dabur Abhrak Bhasma to be taken in the morning and evening with honey or as directed by the Physician. Light and easily digestible food. When taking Dabur Abhrak Bhasma avoid Jaggery, Chillies, Pulses, Sour substances like lmli, Curd, Tomatoes etc.